At the end of a week of protests by red-shirted anti-government protesters, Thailand's deep divisions are no closer to being healed. But there has been a shift in the political discourse. As the convoys of trucks and buses converged on Bangkok, the red-shirts, or the United Front for Democracy against Dictatorship, as they are formally known, faced several tests. First was a numbers game. The rally's organisers had promised a "Million-Man March". That was never realistic. But at its peak there were between 100,000 to 150,000 people packed into the streets of Bangkok's historic old town, demanding that the Prime Minister Abhisit Vejjajiva dissolve parliament and announce fresh elections. It pointed to a level of popular discontent that the government is finding hard to ignore. Second, despite another flurry of overhyped reports in the local media in advance, the demonstration has remained peaceful. For that, credit must go to both sides. The red-shirt leaders have, thus far, managed to maintain discipline. Yes, there has been blood spilled, during ritualistic curses at both Government House and Mr Abhisit's private residence, but there has been no violence. The government has allowed the demonstrations to take place, avoiding confrontation. The security forces have held back. Third, perhaps the biggest question hanging over the red-shirt rally was the extent to which this has become a genuine anti-government, anti-establishment, political movement, rather than just a political front for the ousted Prime Minister Thaksin Shinawatra. Despite his self-imposed exile, to escape a jail sentenced for corruption, Mr Thaksin remains influential. He has called into the rally via video link on most days. In parts of Thailand, as I found during a recent visit to the North East, Mr Thaksin is still admired with an almost cult-like devotion. Many of those protesting in recent days have his face emblazoned across their red T-shirts. But the leaders on stage, delivering their rallying speeches, have kept references to Mr Thaksin to a minimum. 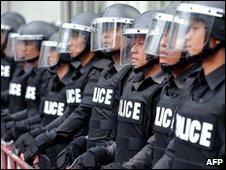 The root of Thailand's current political quagmire lies in the 2006 military coup which forced Mr Thaksin from power. But many of those taking to the streets this week were expressing their anger over principle, not personality. Whatever his faults, Thaksin Shinawatra was elected by popular mandate. The current government was installed by parliament, with the backing of the military. The fact that Mr Abhisit retreated to the safety of an army barracks once the protests got under way merely served to reinforce that point. One of the most significant moments of the anti-government rally was when the protest moved across town to Mr Abhisit's home. Crowds lined the streets and footbridges to wave and cheer as the noisy convoy passed. Office workers, shopkeepers and waitresses - not the rural poor who make up the red-shirts base - but Bangkok's middle class. This week's rally has tapped into a well of resentment, a perception that the political deck is stacked in favour of an establishment elite who believe they have a right to rule. 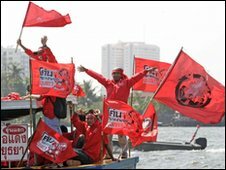 The red-shirts are demanding the right to elect their own government through the ballot box. The government has consistently said that it respects the red-shirts' right to demonstrate but thinks the protesters' grievances would be better expressed through the system rather than on the streets. But that misses the point. The protesters who took to the streets this week, and those who cheered them on, have lost faith in the system. That is the real issue at the heart of Thailand's current problems.